Had enough of shoes, coats and bags never making it to your closet? Do piles of junk mail mock you on the kitchen table before swallowing your keys and birthday checks? Fear not! Your current mess holds insight to the solution that is both efficient and beautiful. Use the power of the dark side. Instead of seeing piles as the enemy, use them for good by observing the natural flow of your home. Busy people leave things where it’s most convenient, Rather than fight the natural traffic pattern, work with it, creating your drop zone(s) where the piles naturally accumulate. What’s in those piles, anyway? Shoes? Put a basket, shelf or bench with cubbies right where they are. Keys? Try hooks, a basket, or shelf near the door so last minute getaways are a breeze. Mail? Individual labeled wall pockets (Filing, bills, outgoing mail) keeps it at bay. For coats, umbrellas, backpacks – both hooks and cubbies near the door work well. Not much room? Think vertically. Level up your drop zone by including a flat surface (a shelf or small table) and a stash of pens near your wall pockets for sorting mail, or signing a check. 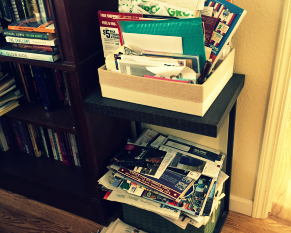 Add a basket for paper recycling to keep junk mail from accumulating (and mocking you) elsewhere. You could even add a charging station, conveniently keeping electronics accessible and ready when you head out the door. Do or do not…there is no try. DesignFix is a Silicon Valley home design + functionality partnership that combines design and engineering expertise to quickly maximize the beauty and usefulness of your home.